If you haven’t read the first two books in the trilogy don’t read this review. I don’t want to ruin who lives and dies for you. If you want spoiler free reviews of the first two books you can check out my review for The 5th Wave here and The Infinite Sea here. The Last Star was everything I wanted and more. The conclusion was great, heck the whole book was great. The plot was fast paced and kept me on my toes. I am still sad that I won’t get to read more about these characters but I feel like it ended nicely and I’m satisfied. Sam.I loved that you could really see how much everything has changed Sam. He can’t remember his ABCs yet he can build a bomb, he has grown up too fast and it’s sad. All the couples. So there is one couple that people seem to be really upset about. They keep talking about how there was never anything between these two characters and that Yancey just put them together because it had to be, but this is just not how I saw it. As much as I hated it these two had chemistry from the start and I have seen them getting together the whole time. So in a way I was kind of happy they finally got together. The characters. I loved them for the same reasons I have in the first two books. They all have such great personalities and I have really enjoyed watching them grow and change. The ending. If you have read the book you will understand why I have mixed feelings about the ending. That being said, it was really satisfying ending and I feel like it was a good conclusion for the trilogy. There is a fair amount of cursing, it’s not full of it; but there is use of the f word a little more often than I would like. There isn’t a whole lot, but there is some and there is a fair amount of discussion about it. A little, but it’s not terrible. Probably, I was very close to crying but I held it together. Rick Yancey, who you can follow on his website. He has a pretty awesome and up to date Facebook page. 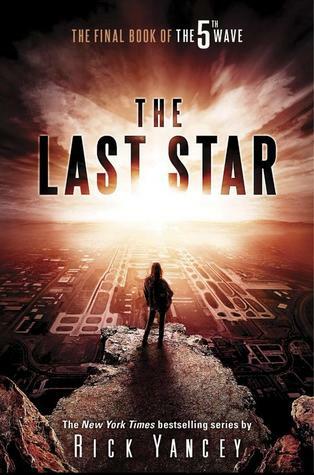 If you have read The Last Star, what do you think about it? Were you satisfied? Also, did you feel like Cassie was a tiny bit inconsistent in this one? I’m on the fence about it myself.